When Scott Alper and colleagues looked for candidate regulators of mammalian innate immunity based on gene expression data, the hit rate was only around 2%. By using a comparative genomics approach — starting with an RNAi screen in Caenorhabditis elegans — their hit rate rose to nearly 30%. In a new GENETICS article, published as part of the GSA Journals’ Genetics of Immunity collection, the team demonstrates the power of their method by identifying a factor that controls alternative splicing of Myd88, a critical signaling adaptor in many innate immunity signaling pathways in mammals. To protect us from disease, the innate immune system must be delicately regulated. A defective response leaves us vulnerable to infection, while over zealous activation can provoke or aggravate inflammatory diseases like atherosclerosis, asthma and cancer. To find new candidates for innate immune regulators, De Arras et al. screened over half of the C. elegans genome for genes that affect expression of a GFP-fused lectin regulated by several innate immune signaling pathways. The team identified 20 mammalian orthologues of the C. elegans candidates, and then tested whether they also have regulatory function in a mouse macrophage cell line. They inhibited each gene with RNAi, stimulated the innate immune system and measured production of the pro-inflammatory cytokine IL-6 as an indicator of the innate immune response. Around half the candidates were implicated in immune regulation by this assay, and the effects of two of these genes were validated by demonstrating that their overexpression induced an effect opposite to that induced by RNAi-mediated inhibition. One of these candidates, Eftud2, is associated with the U5 snRP and is involved in controlling mRNA splicing. The authors investigated whether Eftud2, like other known splicing factors, regulates alternative splicing of the signaling adapter MyD88. MyD88 acts downstream of most toll-like receptors (TLRs), key defense proteins that sense pathogens and danger signals. In contrast to its full-length counterpart which is a positive effector in TLR signaling pathways, a shorter splice variant of MyD88 negatively regulates TLR signaling. Eftud2 inhibition decreased the level of the long (activating) form of MyD88 and increased the level of the short (inhibitory) variant. Crucially, depleting the short splice form of MyD88 was able to substantially rescue the effect of Eftud2 inhibition, indicating that much of Eftud2’s effect is mediated by altered splicing of MyD88. Genes with functions conserved all the way from nematode to mouse will likely play similar roles in humans, the authors argue, so the candidates emerging from this project may prove relevant to human infectious and inflammatory disease. 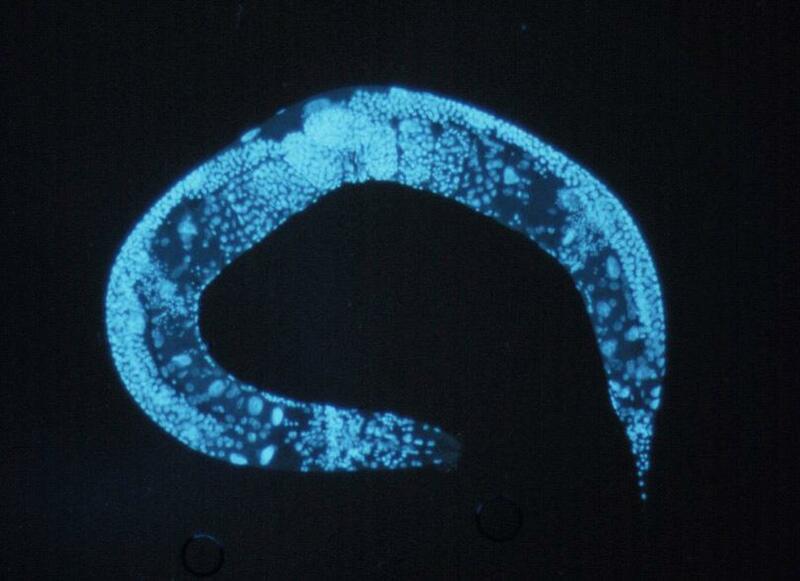 Despite the millions of years of evolution that separate us from C. elegans, we can still glean valuable clues to human biology by turning to the worm.